Thanks to Mad for this awesome guest post! –k. It’s not often you get asked to guest post on the most famous cooking blog this side of the Mississippi! 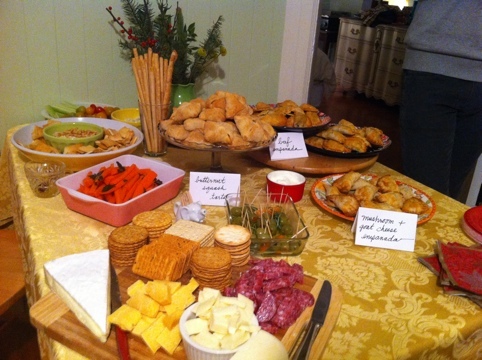 Last Saturday night, I assisted in hosting a holiday party of epic proportions. The menu of food and drinks was pretty spectacular, as far as house parties go, and included such past classics as beef empanadas and cinnamon chicken. This time around, we included something I knew would be a hit: butternut squash and caramelized onion pastries. Although I had made these several times before, some sort of gastronomic amnesia prevented me from remembering how incredibly labor intensive they can be. Making anything bite-size is bound to end up a fairly monotonous exercise, but the end result is terrific addition for any appetizer spread. I originally found this recipe on Patent and the Pantry, although I’ve made a few subtractions to it.